A STRAY kitten has cheated death and made a miraculous recovery from the horrific injuries it suffered after falling into a recycling machine. 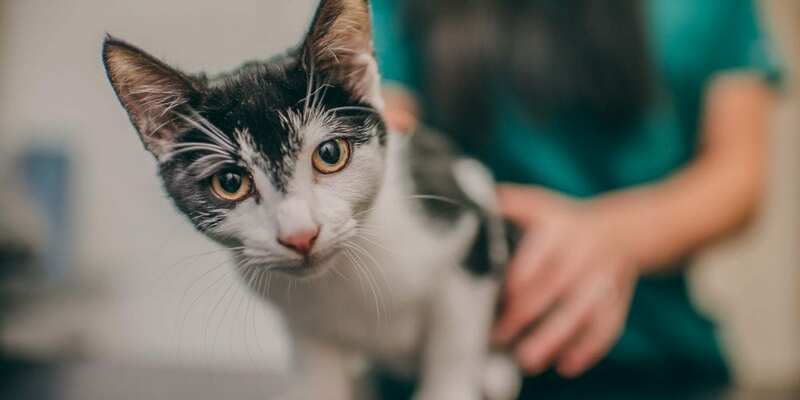 The black and white cat – named Pip by her rescuers – was only five weeks old when she was discovered by workers at a recycling plant with a head injury as well as serious eye and ear infections. But thanks to the quick thinking of plant workers and staff from rescue charity Warrington Animal Welfare, Pip was rushed to Beech House Veterinary Centre where a veterinary team battled for 24 hours to save her life. Despite her tender age and the nature of her injuries – which included a 90-degree head ‘tilt’ trauma caused by the fall – Pip confounded everyone’s expectations. Several months on and the kitten has now bounced back to health…and into a new ‘forever home’. Beech House veterinary nurse Laura Darlington, 30, who was on duty when Pip was rushed in, said it was initially touch and go as to whether the kitten would make it through the night. 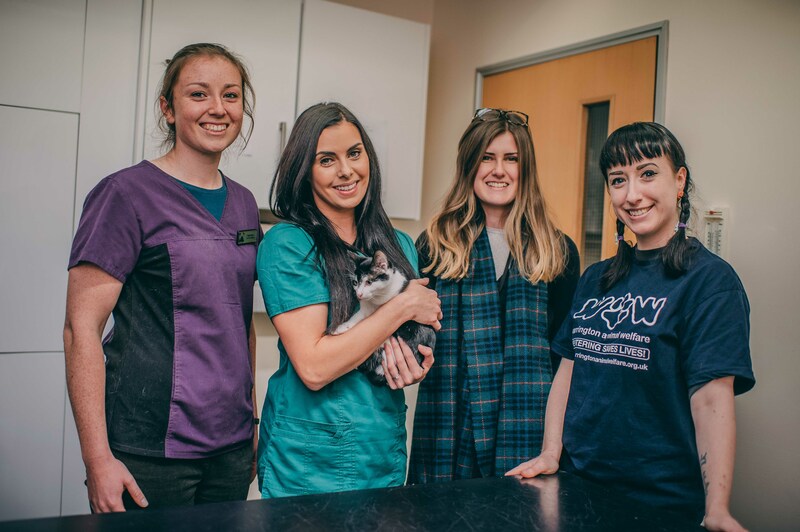 So serious was Pip’s condition that Laura, who lives in Widnes and has worked at the Warrington-based Beech House Veterinary Centre for the past four years, feared the worst for the little cat, despite the team’s best efforts. Beech House is part of the Willow Veterinary Group, which has 25 small animal practices, a referral veterinary hospital, two equine centres and a seven-office farm practice, located across Cheshire, into North Wales, the Wirral and Staffordshire. The veterinary team continued to intensively care for the stray kitten, treating her eye and ear infections and using physiotherapy to encourage Pip to walk and regain her strength. “She was so lovely, but very small – you couldn’t help but feel sorry for her,” Laura added. After two days, Pip was strong enough to be returned to the rescue centre, where Warrington Animal Welfare assistant manager Louise Allen took the lucky kitten home to continue with her rehabilitation. Louise, 33, from Runcorn, said that Pip’s curious and cheeky character showed she was a real fighter, refusing to let the head tilt – which means her neck bends at an angle – get in her way. “The first few weeks as her foster were quite intensive, as she was still on medical treatment for her eyes and ears. Finding food she could eat with her head tilt was a challenge, she would end up with gravy running down her face! “But Pip had a strong personality from the beginning – she was very feisty and more of a playful cat than a cuddle cat. Beech House vet Emily Guest said that while Pip will most likely always have a level of tilt to her head, there was no reason why she couldn’t live like a normal cat. 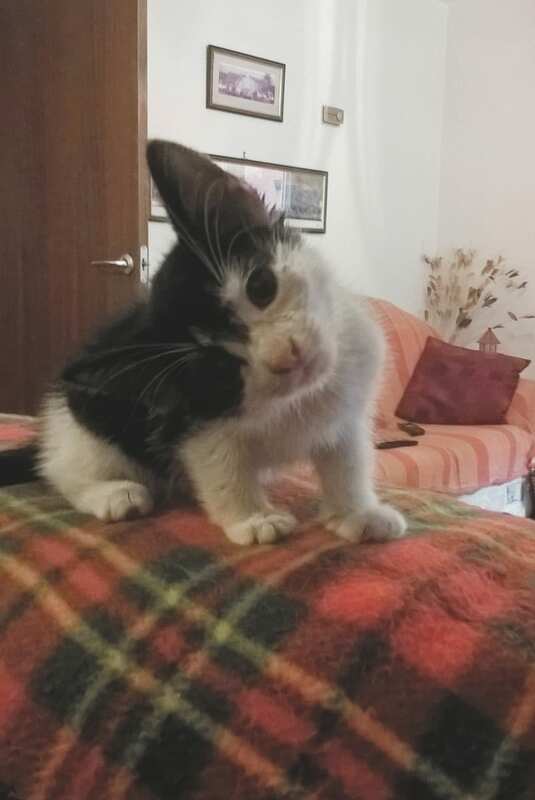 Thanks to the love and care from Louise and the Beech House veterinary team, little Pip has continued to improve, with her head tilt reducing enough for the kitten to be put up for rehoming. And just last month, Pip and her dramatic rescue story had its happy ending. After seeing a rehoming advert on Warrington Animal Welfare’s Facebook page, 23-year-old Nikki Carters stepped in to provide the brave rescue kitten with a forever home. Strategic management consultant Nikki, who lives with her husband Chris in Rixton, Warrington and already had two rescue cats, instantly fell in love with the ‘cheeky and wonky’ Pip. “As soon as we saw her, my husband said we couldn’t leave her so that was that. The couple took Pip in as a nine-week-old kitten and now three months old, she is continuing to grow into a strong and healthy cat. “Pip was wary of people at first but was really good with our two other cats Noodles and Charlie, in fact we think she leads them astray!